With Survivor Series in the rear view mirror, we now look forward to the last PPV of WWE in 2018: TLC. TLC is set to take place on December 16, 2018. The event will air live from the SAP Center in San Jose, California. Many matches have been confirmed for the PPV, except for the Seth Rollins v/s Dean Ambrose match, RAW’s side looks quite weak. Lesnar will not be defending his title yet again, while we may have AOP defending their Tag Team Titles against Bobby Roode and Chad Gable. On the flip side, the matches booked by the blue brand have the fans invested and have been built-up well. We will have the first ever TLC Triple Threat Match for the women, which would feature Becky Lynch defending her SD Live Women’s championship against Charlotte and Asuka. Also, AJ Styles will challenge Daniel Bryan for the WWE Championship in an attempt to win his title back. WWE may also be building towards a highly physical match between Shinsuke Nakamura and Rusev, which may finally see The Bulgarian Brute winning his first title as a face. Amidst this, less attention has been drawn to the SD Live Tag Team Championship Match. 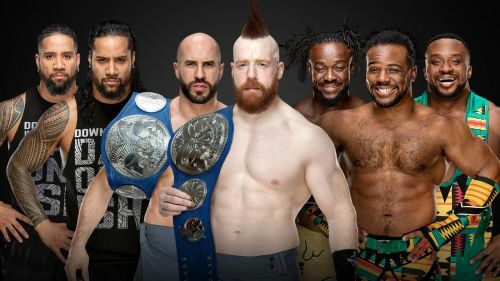 The current SD Live Tag Team champions, The Bar will defend their titles against The New Day and The Usos in an action packed Triple Threat Tag Team Match. With rumors circulating about many title changes being planned for the TLC PPV, can we see new Tag Team Champions being crowned on the Blue Brand? If yes, then which team will be winning the match: The Usos or The New Day? Well, odds are the SD Live Tag Team titles are going to change hands and it will be The Usos who will be winning the match. Many may wonder why, but let us take a look at the way they have been booked so far. They were the captains of the SD Live Team heading into Survivor Series and were the sole survivors too. Following that, they have even pinned the current tag team champions. One may argue that even New Day pinned Sheamus and Cesaro a few weeks back, but Usos getting the pinfall victory over Cesaro on the 4th December 2018 edition of SmackDown somewhat guarantees that SmackDown Live is soon going to turn into the USO PENETITIARY! Also, the gimmick of New Day and The Bar has grown stale. One may put forth the same argument against the Usos, but they should remember that Usos were kept off-screen for a long time before making their return before Survivor Series. Since then, Usos have had a lot of momentum and are the favorites to win the title come TLC. Let us also examine the long term effects of The Usos winning the title. Usos, in this new and modified gimmick of theirs, can work both as a heel or a face. But, they do work better as a face. Also, it should be Sanity who rises up to challenge The Usos for the SD Live Tag Team Titles at WrestleMania 35. This would be the ideal matchup for the ‘Grandest Stage Of Them All’ as these teams have proved that they can work well with each other in the ring. Also, New Day v/s Sanity has taken place a lot of times earlier this year and I do not think that WWE would be keen on pushing a heel v/s heel feud for such a great event. Usos can go on to lose the SD Live Tag Team Titles to Sanity at WrestleMania 35, before switching over to RAW and reviving the Tag Team division of the Red Brand. All the Superstars heading into WrestleMania 35 as Champions, where were they last year?